A critical role of the department is ensuring MCHD’s paramedics are trained and best positioned to utilize their knowledge, abilities, and talents in the field. MCHD creates an environment where our paramedics continuously develop their skills as a provider while growing within the agency and are trusted with more responsibility. The following are the different levels of credentialing utilized by MCHD. In order to maintain the current level of authorization, the paramedic must successfully pass a re-credentialing exam every other year. PI – Attendant: This is an emergency medical provider who has passed credentialing exams and holds a TDSHS EMT-Intermediate or EMT-Paramedic certification or license. PII – In Charge: This is a paramedic who has shown clinical proficiency through multiple written and scenario evaluations. They have limited clinical authority and consults with higher-authorized provider prior to performing certain skills. PIII – In Charge: An In Charge who has demonstrated enhanced clinical proficiency beyond that of a PII. This paramedic has an expanded level of clinical authority and is no longer required to consult with a higher-authorized provider prior to performing certain skills. PIV – Supervisor: The highest level of authorization for MCHD is a PIV. This employee has shown excellent operational and clinical proficiency. They are authorized to provide medical direction through consults to paramedics at lower levels of authorization. 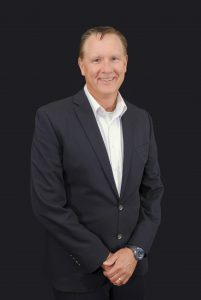 Dr. Dickson is a native Texan and graduated from the University of Texas San Antonio medical school in 1997. He did emergency medicine post – graduate training at Indiana University and has worked as a practicing emergency physician and educator in Texas and NZ. He is board certified in emergency medicine, EMS medicine and holds fellowship in both the American and Australasian Colleges of Emergency Medicine. His academic interests include acute neurologic emergencies, EMS and systems of care in time sensitive emergencies. He has authored multiple articles on these topics and has lectured regionally, nationally and internationally. In his spare time he enjoys cycling, travel and swimming. Casey Patrick grew up in Williamsburg, KY and graduated from The University of the Cumberlands in 2000. Following his undergraduate studies, Patrick received his MD from The University of Kentucky College of Medicine in 2004. In 2007, he completed residency training in Emergency Medicine at Indiana University. Since residency he has practiced EM in both Indiana and Texas. 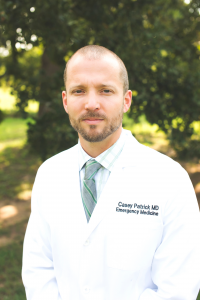 Currently, Dr. Patrick is Assistant Medical Director for the Montgomery County Hospital District EMS service and works in multiple community emergency departments in the Greater Houston area. His EMS educational focus is on innovative paramedic teaching via the MCHD Paramedic Podcast Dr. Patrick’s prehospital clinical research involves using bolus intravenous nitroglycerin for acute pulmonary edema and implementation of lung protective ventilation strategies for . Casey and his wife, Alyssa, work and live in Conroe, TX and Spokane, WA. Together they have five children: Mia, Ainsley, Brock, Dean and Will. Gayet-Ageron A et al. Effect of Treatment Delay on the Effectiveness and Safety of Antifibrinolytics in Acute Severe Haemorrhage: A Meta-Analysis of Individual Patient-Level Data From 40138 Bleeding Patients. Lancet 2017. Effects of Tranexamic Acid on Death, Vascular Occlusive Events, And Blood Transfusion in Trauma Patients With Significant Haemorrhage (CRASH-2): A Randomised, Placebo-Controlled Trial. Lancet 2010. Morrison J.J., Dubose J.J., Rasmussen T.E., Midwinter M.J. (2012). Military Application of Tranexamic Acid in Trauma Emergency Resuscitation (MATTERs) Study. Arch Surg, 2012 Feb;147(2):113-9. Cotter G, Metzkor E, Kaluski E, et al. Randomised trial of high-dose isosorbide dinitrate plus low-dose furosemide versus high-dose furosemide plus low-dose isosorbide dinitrate in severe pulmonary oedema. Lancet. 1998;351(9100):389-93. Levy P, Compton S, Welch R, et al. Treatment of severe decompensated heart failure with high-dose intravenous nitroglycerin: a feasibility and outcome analysis. Ann Emerg Med. 2007;50(2):144-52. Wilson SS, Kwiatkowski GM, Millis SR, et al. Use of nitroglycerin by bolus prevents intensive care unit admission in patients with acute hypertensive heart failure. Am J Emerg Med.2017;35(1):126-31. Boyer AF, Schoenberg N, Babcock H, et al. A prospective evaluation of ventilator-associated conditions and infection-related ventilator-associated conditions. Chest 2015;147:68–81. Ranieri VM, Rubenfeld GD, Thompson BT, et al., The ARDS definition task force. Acute respiratory distress syndrome. JAMA 2012;307:2526–2533. (No authors listed). Ventilation with lower tidal volumes as compared with traditional tidal volumes for acute lung injury and the acute respiratory distress syndrome. The Acute Respiratory Distress Syndrome Network. N Engl J Med 2000;342:1301–1308. Turner JS, et al, Feasibility of upright patient positioning and intubation success rates at two academic emergency departments, American Journal of Emergency Medicine 2017. Weingart SD. Preoxygenation, reoxygenation, and delayed sequence intubation in the emergency department. J Emerg Med. 2011 Jun;40(6):661-7. Epub 2010 Apr 8. Review. Weingart, SD & Levitan, RM. 2012. Preoxygenation and prevention of desaturation during emergency airway management. Ann Emerg Med, 59(3): 165-75. Brewer JM, et al. Can Vasopressors Safely Be Administered Through Peripheral Intravenous Catheters Compared With Central Venous Catheters? Ann Emerg Med 2015. De Backer D, Aldecoa C, Njimi H, Vincent JL. Dopamine versus norepinephrine in the treatment of septic shock: a meta-analysis*. Critical care medicine. 40(3):725-30. 2012.